The panic level of liberals across social media, the democrat political class, and the liberal media are spiking today as reactions are coming out to Attorney General (AG) William Barr's congressional testimony on his planned review of the conduct of intelligence agencies leading up to the 2016 presidential election and after the election, to determine if the investigation into whether anyone in the Trump campaign colluded with Russia, was "adequately predicated." The firestorm of reactions by the aforementioned groups came from the 2:35 minute clip below, where the AG was explaining why he is reviewing "both the genesis and conduct" of the Russia investigation, as he explains that to him, spying on a political campaign is a "big deal." Note at the 52 second mark where Democrat congresswoman Jeanne Sheehan asks "But you're not suggesting that spying occurred?" The look on his face is priceless, as he actually stutters as if he cannot believe that with all the information already available that she was even asking that question, before he answers, "I don't ... well ... I guess you could — I think spying did occur. Yes, I think spying did occur." Dead silence until Sheehan attempted to regroup and move on, when he then continued to state "But the question is whether it was predicated, adequately predicated. And I'm not suggesting that it wasn't adequately predicated. But I need to explore that." Bar then made it clear he wasn't launching an investigation of just the FBI as a whole, but that he thinks "there was a failure among a group of leaders at the upper echelon......" of the intelligence agencies. Exactly what conservative media and Independent Media has been reporting for over two years, while the MSM denied it, criticized it, called it "fake news," and labeled those reporting it as "conspiracy theorists." While Independent Media readers and writers, and conservatives, won't be surprised at all that intelligence agencies under the Obama administration spied on the Trump campaign, liberals across the board that have focused on nothing but the "Russia collusion" narrative that collapsed when special counsel Mueller's report found the Trump campaign did not "conspire or coordinate" with Russia to interference in the 2016 presidential election, and those that never leave their bubble of MSNBC or CNN generated "Orange man bad" spin, still think that the Obama administration's spying on the Trump campaign is just a "conspiracy theory." 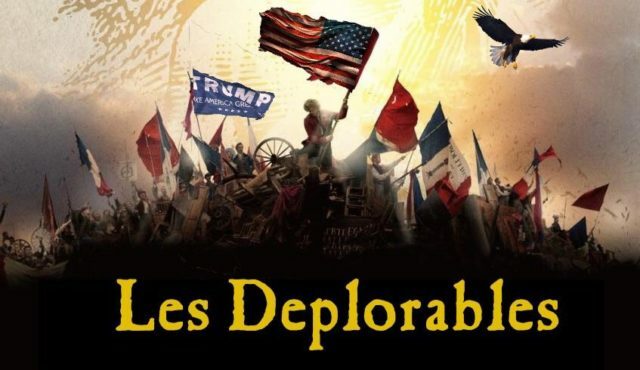 There are a whole lot of people, mainly liberals, that have been led to believe by the mainstream media, considered the propaganda arm of the Democrat party by conservatives, (and many Independents! ), that the "Spygate" scandal was all one big conspiracy theory, and who will now know that not only were they lied to about "Russian collusion" for nearly three years, but that there are enough questions and documentation to justify an official review to be undertaken by the Attorney General himself and his team, into the misconduct of the intelligence community in regards to the "insurance policy" set up by lead officials to try to take down a sitting president. In other words, this might not be "news" to us in the Independent Media community, but it will be a shocker to those already reeling from the "no collusion" conclusion by Robert Mueller. AG Barr just forced the NYT to red-pill Americans. Surprise! Later in the hearing, Democrat Sen. Brian Schatz, asked Barr to rephrase stating "Do you wanna rephrase what you're doing because I think the word 'spying' could cause people in the cable news ecosystem to freak out." Barr's response probably made the Senator wish he hadn't asked that, when Barr replied "Unauthorized surveillance ... is that more appropriate in your eyes?" Despite this exchange occurring only hours ago, a number of reactions from hard-core liberals are starting to stream online, starting with the only AG to ever have been held in contempt of Congress, Obama's former AG Eric Holder, tweeted out "When there is a predicate, a legitimate basis, it’s called “investigating” not “spying”. I am confident that the people at DOJ/FBI conducted themselves in an appropriate way. No evidence to suggest otherwise." Interesting how he claims there is no evidence when he hasn't held an administrative position since 2015 when he was replaced with Loretta Lynch, so how exactly would he know what evidence Barr has already seen or been informed of in 2019? Democrat House Intelligence Committee chairman Adam Schiff is not happy with Barr's terminology either, issuing a statement saying "The top law enforcement officer of the country should not casually suggest that those under his purview engaged in ‘spying’ on a political campaign. This type of partisan talking point may please Donald Trump, who rails against a ‘deep state coup,’ but it also strikes another destructive blow to our democratic institutions." Democrat head of the House Judiciary Committee, Jerry Nadler, made his displeasure known on Twitter, stating "These comments directly contradict what DOJ previously told us. I’ve asked DOJ to brief us immediately. In the meantime, the AG still owes us the full Mueller report." Unsurprisingly other anti-Trump liberal media outlets are already into damage control mode, with CNN headlining "Barr says spying on Trump campaign ‘did occur,’ but provides no evidence." 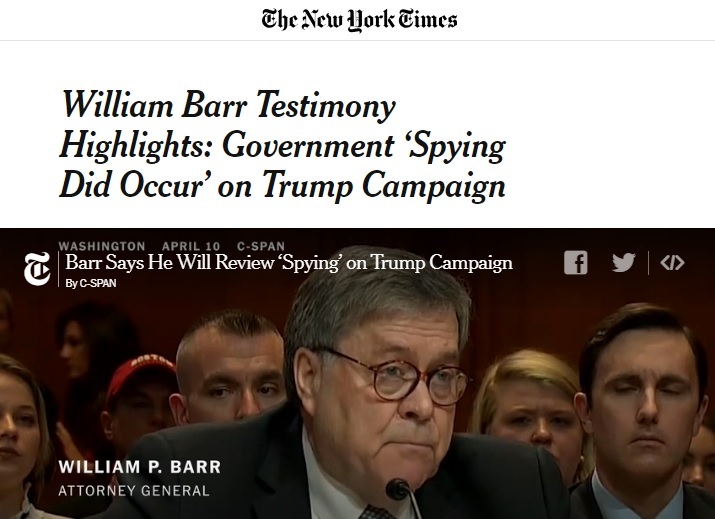 Washington Post's spin: "William Barr is doing exactly what Trump hired him to do," goes well with Vanity Fair's headline, "William Barr Gives Trump What He Wants, Forms Team to Investigate the F.B.I." Two more Washington Post headlines: "Attorney general says he believes ‘spying did occur’" in campaign probe of Trump associates," and "William Barr's highly questionable use of Trump's ‘spying’ talking point." Over on social media the #Resistance starts circling the wagons, as captured by Twitchy. MSNBC politcal analyst Zerlina Maxwell: "Why does AG Barr deserve the benefit of the doubt and labels like "institutionalist" when he's out here today sounding like a crazy conspiracy theorist?" NBC and MSNBC leal analyst Mimi Rocah responds to Maxwell: "I agree. He is spouting extreme political talking points. He sounds like a right wing congressman not the AG of the DOJ." Malcolm Nance, who has NBC/MSNBC in his bio, though I am not sure if he is a paid commentator or not, states "WARNING: Now the REAL Trump-Russia scandal. Barr is now openly preparing to cover up Trump & Russia’s malfeasance by investigating Obama admin & FBI for doing their duty detecting an insider attack on the country. 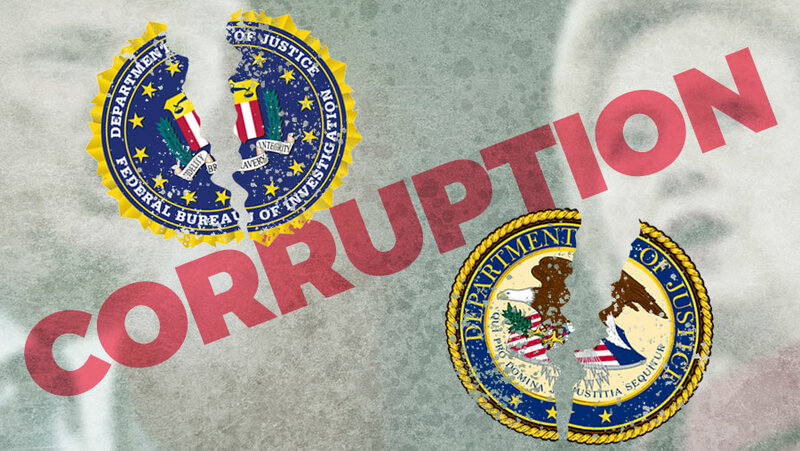 The DOJ is now a Dictator’s Weapon." Liberal activist Amy Siskind: "Trump is using the word “coup.” Barr is saying he will investigate FBI leaders. Things are escalating and Barr is very much in sync." Liberal Adam Blickstein: "The Attorney General is calling his own department's legitimate law enforcement operations that were approved impartial judges "spying." Barr is just as dangerous to the rule of law as Trump." #Resistance member Max Bergmann: "Barr just went full Nunes - accuses intel agencies of "spying" on Trump's campaign." Plenty more of the same type of hysteria from the #Resistance portion of Twitter, found at Twitchy. For nearly three years Americans that have heard 'Russia collusion' over and over and over again from the liberal media, while conservative "Deplorables" have wondered when the "collusion" between the upper echelon's of the intelligence community and the Hillary Clinton campaign, who paid for the unverified Steele Dossier that the FBI used to obtain multiple FISA warrants on Carter Page, once with the Trump campaign, would be fully investigated. While the media will continue to try to keep the Mueller investigation and their Russia collusion and "obstruction" narrative alive, especially hammering every detail when the Mueller report is released, basically the collusion issue is yesterday's news, so to speak, but this investigation into the actions of members of the intelligence agencies, and the "genesis and conduct" of those officials regarding the Russia collusion investigation, is what we have been impatiently waiting for. With the announcement that Barr will be looking into the "spying," aka "unauthorized surveillance" along with Barr's assertion that the DOJ's Inspector General report into some of these same matters is concluding and the report coming shortly, a page is turning, despite the media attempts to hold it to the same page, and many of us that almost gave up hope of seeing the investigative results of the Obama administration's antics, are cautiously optimistic that the nation will learn the extent of the spying operation against President Trump.